Available in a large range of sizes, S4 is supplied as a complete kit of double glazed window and integrated Blind flyscreen system, all in one box. 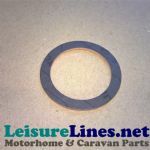 The Seitz S4 is the window of choice by many motorhome and camper manufacturers throughout Europe and is ideal for Caravans Motorhomes Racehomes and Horseboxes. Easy installation and long life span are guaranteed: Outer and inner frame are simply screwed together from inside, clamping the window to the vehicle wall, for a lasting and continuous seal. For wall thicknesses 26 to 41mm (requires trimming of inner frame). The windows are securely fastened by screwing the inner frame to the outer window clamping the window securely in position. Outer Black RAL9005 frame with Grey tinted acrylic double glazed pane. Inner frame is cream-white RAL9001. Blind material is white to the interior with a thermally reflective silver aluminised coating to the outside. Fly net is white with no pattern. High quality windows Highly recommended by LeisureLines. fly net to the inside. Safety catches prevent window from being opened from outside. direction) and the sliding pane to the front. Sliding windows are not handed they are simply inverted in relation to blind inner frame to be installed on either side. 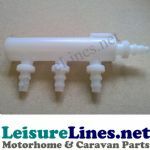 We keep a significant quantity of the popular sizes in stock.